Summer is fire season in California. This is what the sun looked like on August 18th about an hour before sunset. The smoky foggy skies made for such an interesting color. I posted this photo on Facebook the other day. This is what I wrote: If a photo could look like a moment of zen, this one does it for me. It's been foggy for days. The sky and bay are one. The birds are on an island of the mind. The grasses are the signed portrait of a moment. Eat FOOD. 90% of what’s in today’s supermarkets is not food. Become familiar with the PRODUCE section and investigate new recipes. Herbal Teas-- No Black Tea. Uh-oh. I live on tofu, dairy, red fruits, and I drink black tea. Their theory is that these acidifying substances are de-mineralizing my bones. I'm going to simply dismiss this theory. Wouldn't you? I've been dealing with bone loss for years and years. If you search on the word osteoporosis on the blog, you will see so many well-written (LOL!) posts dating all the way back to 2006. I was really hoping that my efforts would have had better results. Now I'm just going to start googling around to see what percentage of people with osteoporosis actually break their bones. I'm hoping the news will be good and not make me any crazier than I already am. In the meantime, I'm on the couch nursing a bad back, and the sun is shining here for the first time in weeks with temps in the high 70s. It's a heatwave, I tell you, a north coast heatwave! This photo makes me think we are holding the world in our hands. It tells a long story of love and family. Here we are. My second cousin Gabi and me here in Arcata skyping with his mother Pili in Israel. I hadn't met Gabi before but he, his wife Tsilla and their son Sol drove up from southern California for Sol's sophomore year here at the university. We met on Sunday and had brunch together. This is who we are and how we are related. Gabi and I share the same great-grandmother, Grossmutter (in german) Minna. His grandfather and my grandmother were brother and sister. His father Micha and my mother were first cousins. In 1921 my grandmother left Germany and came to America. Her mother and brothers stayed. She never saw them again. The family perished in the Holocaust. Many, many years later we were stunned to discover that Micha, one son of my grandmother's brother, had survived. On the day his family was being rounded up and taken away, Micha was not home. When he got home he was told by neighbors to run for his life, and so he did. He ended up in Israel, where he got married and started a family. No one in the family who had already come to America knew there was a survivor. 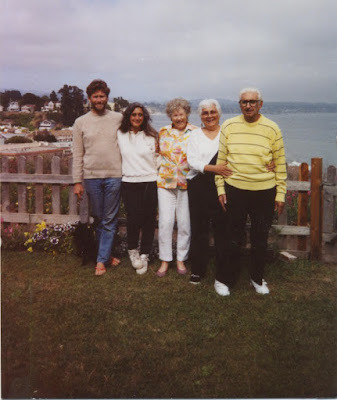 In the late 1970s or early 80s, a distant family member (living in California) with the same last name as Micha made an announcement of his 80th birthday in an Israeli newspaper. The name launched the search for reaching out and reconnecting with family. I wrote this poem about it more than 25 years ago. And now, all these years later, Micha's son Gabi and I are standing in our backyard in Arcata, holding a smart-phone and Skyping with his mother Pili in Israel. We are all connected, aren't we? Not just technologically, but all the way down to our bones and cells. We humans, we are holding the world in our hands. I have wished all of my life that we would hold it like we are one family. I could rant about the tragedy unfolding in our country right now. To say we are blown away and heartbroken would be an understatement. What we have become in a few short months is far more devastating and shocking than anything we could have imagined. But instead of going on with all of that, I'd rather post this. A simple photo of my mother enjoying a cookie, because this is what actually brings me some joy (photo taken by my sister on August 13th!). We've had overcast foggy skies for more than a week. It hung over us with relentless dimness, a shadowless gray that stretched as far as the eyes could see. Day unfolded to night with just a lowering of the gray scales until fully dark. I haven't photographed much of anything for so long, and yet I am not disappointed. What could I possibly post here that could balance the madness that grips our country? I am sitting on a Sunday afternoon typing these words, feeling slightly post-traumatic stressed. I can't think of a single beauty that would balance the unleashed hatred that spilled blood in the streets of Charlottesville. My older brother had talked of going to the rally to protest. We marched together in the streets of Newark, NJ in the late 1960s protesting the war in Vietnam. I called him Saturday morning to check in with him and make sure he wouldn't go. He lives only a half hour drive away. He said he had re-thought it and wouldn't go. He knew it would be dangerous, and it was. Who are we? Why do we still have these same battles year after year, century after century? I'm tired of seeing arms raised in the Nazi salute, swastikas, torches burning, and the signs of the Klan, alt-right symbols and all the newly adopted signs of hatred of our modern world. Who are we? On Saturday we went to a garage sale. When we walked up the driveway the woman sitting there gave me one of those looks. What look was that? The one that said "Oh you brown-skinned person, why are you here on my driveway?" We looked around and then left. When we walked away I said to Roger, "I really don't like that woman." He said, "Why?" I said because of the way she looked at me. He said, "Oh yeah, that, she didn't look at you in a friendly way at all." Okay, so here's one photo. I'm pretending that the birds are shouting. "Who are you? Who are you? Please stop with the violence and hatred. Please." PS: We had to turn on comment moderation for the first time because some unknown comment-bot was leaving ridiculous comments. 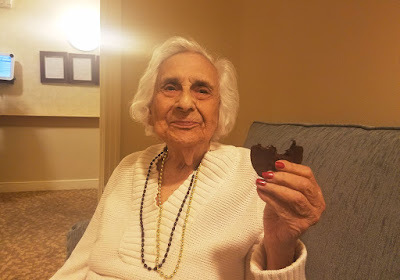 On Wednesday my mom moved into the next level of memory care at the assisted living facility. It was a hard day. Her furniture did not fit quite as well as it did in the previous apartment. She was a bit frantic. She told my brother that she was anxious and upset. My siblings and I were full of despair over it. We understood that she needed to be there, that her desire to wander required a locked and secured wing. She even said to my brother, "Everything is locked here." We emailed back and forth. We lamented the turn of events. We wondered if there could've been another way. On Thursday I took a chance and called the facility and asked to talk to my mother. I braced myself for sadness. When she answered the phone she said, "Hello Robin.." in that voice, that calm slightly out of it voice. She was okay. She told me she slept well. She was fine. "Was the move yesterday? I don't remember." Wow, a sigh of relief. The caregiver just returned my call and spoke to me about her contact with mom yesterday. She said she's already developing a relationship with mom. At one point mom saw her in the hallway and mom said, "A familiar face." And the caregiver replied, "I have been waiting for you for a long time." Later mom went to her office and "B" invited her to sit down so mom sat with her while she worked. Our hearts felt calmer knowing that the caregiver was there taking care of our mom. She is in good hands and hearts right now. We can't ask for anything more. Well, we could, but magic and wishes don't make Alzheimer's go away. Sigh. We thank you all for your kind words and support. Sometimes it takes a virtual village. In 1970, when my twin brother and I graduated from high school in New Jersey, my parents sold our home and moved the family to southern California. They wanted us to go to college in California, and they liked the idea of not having to put up with New Jersey winters anymore. So, my twin brother, younger sister, and a friend of our older brother's drove one of the family cars across country to start our new life. We had never been further west than Pennsylvania! We had never even gone camping before. It was quite a journey, with well-planned campsites in Ohio, Illinois, and Kansas and a lovely stop over in Longmont, Co at a beautiful hippie commune. We made it to southern California and our eyes began to tear from the smog. Seriously. We had never experienced anything like it. That was in July. I applied for a job at some hippie art shop that was in Topanga Canyon half way between the San Fernando Valley and the Pacific Ocean. I hitchhiked to work. I trusted the world. And you readers of this blog know how that turned out for me. My experience of southern California was not a pleasant one. By May of 1971, I decided to head back to New Jersey and spent the summer trying to figure out what to do with the upheaval of my life. Then, I drove back to California, spent the winter of 1971-2 with my parents and left again moving north to Portland, Oregon. I never lived in southern California again. Why is any of this relevant? Because my parents stayed. And now, I have not lived near my mother for more than 45 years. My parents and I visited each other every year, sometimes more than once depending on how close we were. 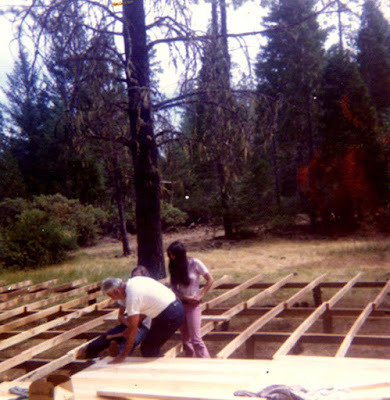 They came to see the 10 acres of land I bought in southern Oregon in 1974 and even helped a bit with our little home-made cabin. They visited me in Boulder, Colorado many times, when my then-husband was the videographer for the CBS affiliate, and I was a student. On one road trip, they went on to Mount Rushmore and then across country to see the east-coast family. A few years later they came to see me in Rhode Island when that same then-husband had a job at the university and I was in graduate school. I like to think that my restlessness helped them see our beautiful country. In 1988, I moved back to California and conveniently moved in with my twin brother and his wife in Santa Cruz while I nursed my broken heart after that crazy marriage ended. I met Roger on New Years eve that year, and we stayed in Santa Cruz until 2004. That was the longest I had stayed in one place since I graduated from high school. Sixteen years. An amazing thing for me. This blog has chronicled our moves since then. Santa Cruz to Port Townsend (2004-2008). Port Townsend to Arcata (2008). Arcata to Santa Cruz (2008-2009). Santa Cruz to Grass Valley (2009-2014). Grass Valley to Arcata. Here. Now. Happy. Not moving. Still, even with all the distance and moving, there is something about love that seems to have bridged all of it. I often think of my grandmother when I am lamenting how far I live from my mother in this waning time of her life. My grandparents came from Germany to this country in 1921. My grandmother left her mother and two brothers and their families in Leipzeig. The only communication they had after that was letters written that crossed the Atlantic. They never saw each other again. There really are things that we can do with pen and paper that carries the heart as far as you can send it. When I think of my mother, I think of all the cards I have sent her in the past three months. Once a week, a love letter and a photo of something beautiful. They were all in her room when we visited last month. She looks at them and re-reads them. Letters are tangible love. Love, love, love in the land of time and distance. so. another year older and not deeper in debt. the decimal system prompts us to pay more attention to numbers ending in zero, and to a lesser extent, ending in 5. but this particular year ending in 5 is surely more worthy of attention than 65 or 55, because it is also 3/4 of a century. i have been alive for 3/4 of a century! and yet, whenever i am it is always now. some times i think that the weight of the past, all of it, good and bad, is what slows us down as we pass from a now of youth to a now of old. it’s just that there is so much of it. new stuff doesn’t always find room in our memory even though old stuff is almost perceivably fading. obviously i am no wiser than last year. hopefully not less wise. my skin has not grown thicker. quite the opposite. i mean my actual dermis. it tears and punctures more easily than it did last year. as i am a bit clumsy my arms and hands suffer continual wounds. on the bright side the very same dermis heals nicely. also my blood pressure is still high enough to warrant treatment. though, despite my doctor’s disapproval, i do eschew meds on days when my blood pressure is close to normal. i’m not complaining though. working in the garden, walking on the beach or in the forest, seeing my family, and living pretty much 24/7 with my wonderful wife robin keeps me busy and happy. i just reread last year's post. i will update my conclusion. it has become a much much stranger trip. and the furry freak brothers are still right on.